Reliable water testing is a pool and maintenance keystone. Helps You Make A Better Water Testing Choice. Scroll down to browse through some feedback from pool and spa owners and pool and spa professionals. Water testing matters and the right tester can make all the difference.. More information about some new and unique products, for Spas and Hot Tubs, can be found by visiting The Website Store. You'll never know what you'll find and that's always fun. Be better prepared and avoid costly problems! 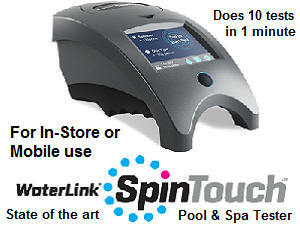 The WaterLink SpinTouch Lab is the ultimate Pool and Spa Water Analyzer, performing 10 different tests, in just 1-minute. A Mobile WaterLink SpinTouch is also available. Pool or Spa Professionals and owners can use a variety of reliable testers, such as ColorQ all-digital photometers, for every need. Click any image for more product and ordering information. * A $9.99 handling charge will apply to Continental U.S. Orders, under $75.00. Orders outside of the Continental U.S. may require some additional charge, based on quantity and destination. Most products can be shipped World-Wide. Update: I tested the results of my SPIN lab with the pool company that I use for testing. Results were almost identical. The SPIN lab saves me a 45 mile trip to have my water tested. Finally got to use the new reagents today, from your website today. Calcium Hardness tested 380 PPM, which is more consistent, with the chemical additions. The bad reagents (seriously out of date) were sold to me by Amazon (believe it or not, Amazon itself, not a third party vendor) and I am sending them back. A hard lesson in water hardness. I was getting low calcium hardness readings, even after adding hardness booster. Do I need to do anything to lower the calcium? The LaMotte book says up to 400 is OK – is that correct? Thank you very much for all your help. I will be ordering ColorQ reagent replacements from you only from now on! Alan, Thank you very much. Your advice over the years has been very helpful and I really appreciate it. You helped me get my chemical testing down too a science with the ColorQ unit. It is more accurate than the measurements from most of the pool stores. Regards. Hi Alan, I received the ColorQ last week and the test strips today. Many thanks. I'm absolutely loving the ColorQ! Wow!!! I know the dream of every pool retailer was to have an in-store water tester, that was truly automatic. Like just add water automatic!!! The new WaterLink SPIN Lab is everything I hoped it could be. Ten tests and a computer printout, in a minute!!! It has cut down on the waiting times and provides the desired reliability, even with new sales help. This is truly the next generation tester. Thanks for all the help over the years. I need a superchlorination. I have no free chlorine reading. I purchased the ColorQ a couple of years ago from you, best thing I ever bought! The second smartest buy was the Salt PockeTester I bought last year! Thank you your web site it has been more than a little helpful!! Thank you so much. This is why I keep shopping through you, for ColorQ replacements. Not only for my personal use, but also for my business. Your prices and customer service are the best! Thank you again. I purchased my Color Q PRO 7 test kit from you and love it. I am trying to make a chart for the correct ranges. Would you please list them for me? Thank you for your help, I just want to get started, with correct numbers, with my new ColorQ PRO 7 test kit. Hi Alan, have been using my ColorQ PRO 7, Digital Water Analyzer. I really like it. THANKS! This is what I always wanted. A tester that doesn't require color matching or ask me to be a chemist. The ColorQ and the Salt PockeTester are so easy to use. I am sure that I will save enough, by avoiding problems, to pay for the testers, over the life of the pool. I am really glad that you suggested these. Thank you! Hi Alan. You have an excellent website and I appreciate the willingness to answer questions. So here goes. I am a new Hot Tub/Spa owner. I have been testing with test strips that require me to evaluate the colors. I have strips that measure Chlorine, Bromine, pH, Alkalinity and Hardness. I have trusted the results. Lately with all of the reading I have done I have become very fearful of my pH being out of range and thus I purchased an automatic test strip reader. This reader has strips that measure Chlorine/Bromine as well as pH and Alkalinity. The strips are dipped and placed face down on the reader and the reader determines the values. The problem is that I can not get the old method and this new reader to agree ever. I have no idea what my pH level is because one reads 7.2 and the standard strips measure 6.0. The strips and the strip reader are made by the same company, so there is no compatibility issue. I realize that I could be judging the colors incorrectly, but I don't think that I am. Which one should I trust? I have checked your electronic testing meters store for the ColorQ testers and I am wondering, if I should be returning my automatic reader and purchasing one of these. My reader cost about $70 but I don't mind spending more if it will read more accurately. I also found that there seems many types of ColorQ models. Which one I should be considering. Thanks. Hi Alan. Just wanted to thank you and let you know that I received my ColorQ PRO 7 tester and it is very easy to use and it is so much better then trying to guess using strips. Thanks again for the info on your site. Alan, awesome website. I just bought the ColorQ Digital Water Analyzer and love it, as I'm colorblind. I've never tested Cyanuric Acid before, and with the ColorQ, I received a reading of "LOW" which means it is too low for the ColorQ to register it (and according to LaMotte, it is accurate +/- 10 when it is between 0-80). Here's my question: If my ColorQ says there is no Cyanuric Acid, and I have a hot-tub with a cover on all the time, do I care? Should I somehow get the Cyanuric Acid up? If so, how? Thank you for your awesome website! Regards. Thank you for your timely response! As I stated in my letter, I log in, writing on a specially ruled pad, each individual test I perform on my pool, so I can keep track of "trends" that I should be aware of. I have been using the ColorQ Water Analyzer since May which may I say is the BEST invention for pool owners since sliced bread! I LOVE IT! I have logged in 40 tests so far and have only used about 1/4 of each 30ml. 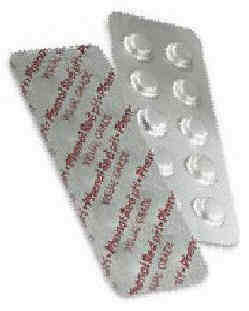 reagent. So doing the math that adds up to at least 140-160 tests, as advertised. Also, I do not test for CH and CYA every time, as I don't feel it is necessary, so those reagents will last even longer. Thanks, again, Alan and to LaMotte for making such a fine instrument that makes my job a breeze! I have had a pool for any years and was never confident about matching colors. either with the liquid testers or the test strips, as I have some color vision problems. When I saw the information on the ColorQ 7 Water Tester, I hoped that it would be my answer. And it was! It is simple to use and I have complete confidence in my test results. Great product and well worth the modest price. Regards.